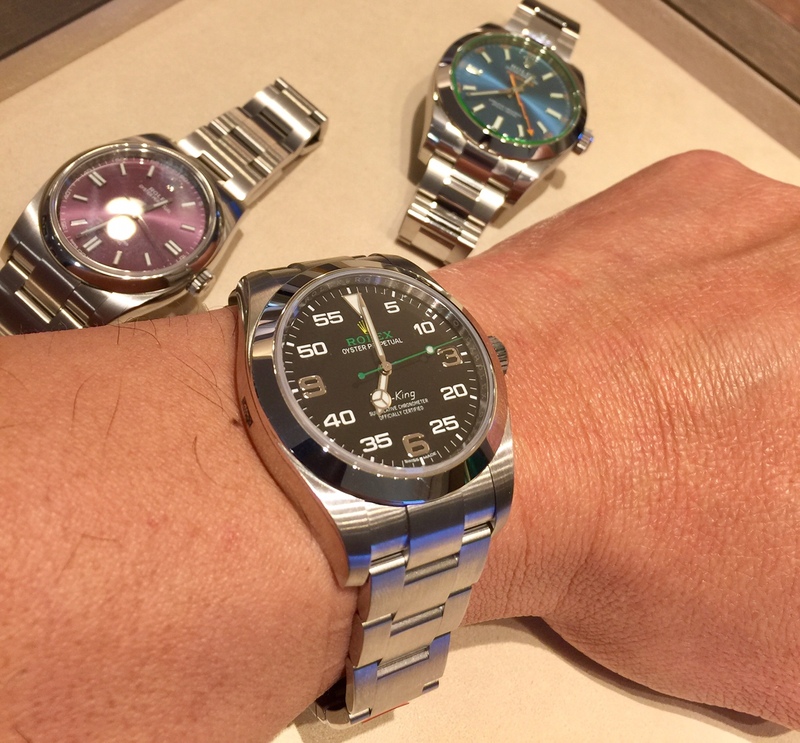 I was obsessing about a Daytona, even to the point of spending $28K (Osterflex) to $38K ( White Gold, Full Bracelet) for a PM Daytona. This bcausse i wont pay 50% over list for a SS Daytona. I just couldn’t rationalize the prce for a PM watch. All the R&D, prestige, special foundry etc., is present in the SS models, the only difference being the metal used in the manufacturing of the watch. $ 28K difference for a PM watch is a bridge too far for me when there is less than 3 ounces of PM in the PM watches. Anyway, you may feel different I do own a 18038 Gold President Day-Date as well as a Kermit Anniversaty Sub and a 1964 Dauphine DateJust. I considering an IWC Pilot watch, but decided it was a bit too busy for me. Then I started researchng the Air King. Most of you probably know the current iteration is a Milgauss under the hood , for $2000 less. A rare bump on a Rolex. The watch just appealed to me. I called the local AD, listened to his spiel about” hard to get”, etc. and bought it. I really lke i. Dispite its thick “faraday cage”, it really wears comforablely. It is a Super COSC timepiece and in the three days ive been wearing it, iit has not gained or lost even 1 second. Big dial, easy to read. I am a 75 year old retired airline pilot.im really happy with my Aviation oriented timepiece. Congratulations. It is great watch. I personally seen it only on one wrist outside AD and it looked really good. It would be great if you could share some pics with us. The Air-King is a fabulous watch It's yellow-green theme is from the cockpit instruments of the Bloodhound Super-Sonic car. Well done on your purchase stay healthy and enjoy. Congrats and welcome to the club! I also walked into the store with intentions of purchasing another watch, but once on the wrist the choice was clear. So funny this watch gets to much hate, but at a party last weekend with several Rolex wearers in attendance they all wanted to check it out and try it on. It got rave reviews! [QUOTE=captainron62;8886928]Congrats and welcome to the club! I also walked into the store with intentions of purchasing another watch, but once on the wrist the choice was clear. So funny this watch gets to much hate, but at a party last weekend with several Rolex wearers in attendance they all wanted to check it out and try it on. It got rave reviews! Oh MY, no I did not. I can't edit it either. Thanks for letting me know, sent to the mods. I just picked up this watch after trying it on for the first time. On the wrist is is comfortable and has the brushed links which I prefer. My first impression was that it looked too busy and unattractive in photos, however, it was a different story on the wrist. The weight is nice and impressive. This watch really "flies" under the radar! Well said, it is a different watch on the wrist than in the pics. I like the substantial feel that the Faraday cage is responsible for. It also makes it present well on the wrist. If I could change one thing, I wish the face was a bit bigger. I think you made a great choice. I really enjoy wearing the Air-King every day. Saw that new Air King during my trip to Italy. First I thought this model looks funny, but in real life it's pretty nice. Congratulations! For weeks now I had my eyes on a new Explorer. It was time to upgrade my 20yo Air King. It was a great watch, but it was time. We drove to an AD today to make the purchase (my wife was trading hers as well). As I worked through the case, something catches my eye... the beautiful new AK. I strap it on... feels perfect on my wrist. My wife gushes over its look. An hour later, I’m the owner of this beautiful timepiece... and I maintained my AK roots too. I absolutely love it. I think it’s cool. I went for the milgauss in the end but nearly changed my mind for this. It’s quirky and the design is great on the face. The modern AK gets its share of knocks from people but I think it's very cool, finally a bit of a different look for Rolex. Only downside for me is the lack of lume (hands and 12:00 index only). I got mine shortly after they came out in 2016. I like the cleanness of the design and the low key, sporty look of it. I just picked up one this afternoon. I absolutely love it. That's an awesome watch! I like bigger watches personally but depends on the wrist. I'm thinking of getting a pair for my sister and her "husband to be" who are getting married. I think it would be a rolex would be a good wedding gift. Please which one do you guys recommend? I like it except the 3-6-9. That’s my only gripe.